Since 1 April 2016 you might have to fork out an extra 3% in Stamp Duty Land Tax if you're buying an additional home. Find out how the controversial tax loading works with our Q&A. Q. What is the 3% Stamp Duty Land Tax (SDLT) surcharge? HMRC calls it the 'Higher Rates on Additional Dwellings' or HRAD for short. A. Anyone who is buying an additional residential property for £40,000 or more. This could mean a holiday home, buy-to-let or even a main residence you plan to live in (more detail on this later). Even if you already own just a share in another property, it will count so long as the share is worth £40,000 or more. Properties anywhere in the world are considered too. So, if you own a 30% share of a £300,000 ski chalet in Bulgaria and are buying your first home in the UK, you could be stung with the extra tax. The higher rates of Stamp Duty Land Tax apply to the purchase of property in England and Northern Ireland also – under separate sets of legislation – in Wales and Scotland too. This Q&A refers to the rules in England and Northern Ireland which are administered by HMRC. See further down the Q&A for more on Wales. A. The surcharge took effect from 1 April, 2016, but it was first announced in the Chancellor’s 2015 Autumn Statement. A. Regular Stamp Duty is, these days, charged on a tiered basis (so you only pay the higher rates on the slice above any threshold – the same as income tax). But the 3% surcharge still effectively works as a slab tax. In other words, the 3% loading applies to the entire purchase price of the property. 'Main residence' refers to the home you live in, not necessarily a property you own. And which home is your main residence will be judged by HMRC as a matter of 'fact'. This means it's not enough just to occupy a property. You'll need to demonstrate a degree of permanence and expectation of continuity for it to be your main residence. For example, where you spend most nights and where the rest of your family lives, where you are registered to vote and where you are signed up to local doctors and dentists. You are not able to 'elect' a main residence as you can for the purposes of Capital Gains Tax. But replacing your main residence means that a previous one will need to be disposed of (eg, SOLD or GIFTED). If you are moving out of rented accommodation or, say, your parents' home, this will NOT count as disposing of your main residence as you are not an owner or part-owner of that property. Q. What if I buy another main residence before I sell my previous one? A. If you keep your former main residence (Home A) and buy another main residence (Home B), you will probably have to pay the 3% Stamp Duty Land Tax surcharge initially on the price of Home B. However, so long as you sell Home A within 36 months of completing on the purchase of Home B, HMRC will make a full refund of the 3% paid on Home B. The refund applies to the sale (or other type of disposal) of any property that has been your only or main residence at some point during the 36 months leading up to the purchase. In other words, you don't have to be moving directly out of one main residence and into a new one. How long you have lived in a previous main residence will not be relevant, so long it qualified as your 'residence' as outlined above. A. As of March 2017, you can apply online. Alternatively, complete one of HMRC’s repayment request forms, print it off and post it to HMRC. Until the Budget on 20 October, 2018, refund applications had to be received within three months of the sale of the old home (or, if later, within one year and 30 days of completion of the purchase of the new home). Since then however, if the sale of the old home completes on or after 29 October 2018, the time limit for applications is extended to 12 months from the date of the sale. HMRC reserves the right to refuse late applications. Q. How long with the refund take? HMRC says it aims to process all refunds within 15 working days of receiving the application. As things stand, HMRC is close to this target, although refunds had previously been taking as long as 55 working days. If your application is successful, payments will be issued by payable order. A. In some cases, (for example, if you are moving back to the UK after living abroad), you may sell your main residence but move into a 'stop gap' home (such as rented accommodation) before you can buy a new home. In this case, with effect for purchases which complete after 26 November 2018, the rules allow for a 'grace period' of 36 months during which time the purchase of your next main residence will NOT be subject to the 3% surcharge. This is so long as the former residence was your main or only home at some point during the 36 months leading up to buying the new one. HOWEVER, for purchases that completed on or before 26 November 2018, these two '36-month tests' did NOT apply. ...to escape paying the extra 3% on the purchase. However, so long as you are NOT married or in a civil partnership, it can sometimes be possible to get around this by the person who does not already own a property, buying the new one in their sole name. We've had confirmation from HMRC that this will NOT be regarded as tax avoidance. But John Shallcross, real estate lawyer and SDLT expert at law firm Blake Morgan says: "It's important that the full beneficial ownership belongs to the other person. It does not work, for example, to have the property in the name of that other person, but holding on trust for the two of you." One problem with putting a new home in just one person's name is satisfying the lender's affordability criteria. But Ray Boulger, senior technical director at mortgage broker John Charcol, said that some banks including Metro Bank and Barclays allow two names on the mortgage agreement but just one name on the property deeds. These are sometimes called Joint Borrower, Sole Proprietor mortgages. Q. What if I am married and one of us owns a property? A. The strategy of having one person (the one without an existing property) buy the new home does not work if you are married or in a civil partnership. This is because the rules will treat you as if you were joint buyers anyway, even if you're not. "This is in contrast to the way married couples and civil partners are treated for other taxes," says John Shallcross, "although it's still not quite true to say they are treated as a single unit." Q. What happens if I've split from my partner but I still have a share of our former home? A. If you were married or in a civil partnership and are buying a property which completes after 22 November 2017 (the day of the 2017 Budget) there are special rules that can help you side-step the 3% surcharge when you go to buy a new home. The rules state that, so long as you do not live in the property you are leaving and an appropriate 'property adjustment order' is made (to the benefit of the person who remains living there), the share you retain in it will NOT count against you. In any of these cases, you will still be liable for the surcharge if you retain your interest in your old property (worth £40,000 or more) when buying a new one. However, if you go onto sell your share of the home back to your former partner (or sell the home entirely) you may be entitled to a refund. This will come under the same replacement of a main residence rules set out above. But John Shallcross warns: "Where the new purchase is made BEFORE the sale of the interest in your former home, there are the three-year rules to look out for. "They state that you will need not only to dispose of the interest within three years of buying the new home, but also to have lived in the former home as your main or only residence within the three years leading up to the purchase." He adds that, in these cases, it's worth checking the property-owning history to see if it throws up something that could 'save the day', such as replacement of a main or only residence rules. Q. How do I work out if the value of my share is £40,000 or more when there is a mortgage? A. The £40,000 test is worked out on the market value of your share in the property BEFORE the mortgage is taken off. For example, if you own a house with your former partner that has a value of £240,000 and an outstanding mortgage of £200,000, your share is likely to be worth £120,000 (or perhaps a discount would apply to reflect it being only a share in a property). It will NOT be worth the £20,000 (£240k value minus the £200k mortgage divided by 2) that you might each expect on the sale of a house. Bear in mind that valuations are taken at the date of the NEW property purchase. Q. I'm separated but still legally married. Will I still be linked for tax purposes if I buy a property alone? A. If you are part of a married couple but separated in circumstances that are likely to become permanent, then if one buys a property the other will NOT automatically be treated as a joint buyer for the purposes of the 3% surcharge. In other words, if you are buying a home that would only incur the 3% surcharge on the basis of your legal spouse's situation, you won't have to pay it. Q. I have a second home but want to buy a further share in the one I live in. Will I be affected? A. Purchasing additional interests in your existing home may be subject to the higher rates if you own other properties on the date of the purchase (if the payment is £40,000 or more). As ever, it's always worth checking the rules around replacement of a main residence to see if they can save you. Q. I am extending the lease of my leasehold flat. Surely the 3% surcharge can't apply to that? A. Unfortunately, it can in some situations if you are paying £40,000 or more for the extension and have interests in other residential properties. However, the rules here are not easy to apply. HMRC's amended guidance (published in November 2016) was the first mention of this and, even then, it was brief. However, it recognised that the replacement of only or main residence exception can apply. The old paragraph (3.6A) of the Guidance Note was not brought forward into the Manual when the guidance was moved at the end of March 2018, but the old Guidance Note can be found here. But the example that was in chapter 9, example 13 can now be found in SDLTM09810 at Example 10. Even better, one of the special rules for purchases completing from 22 November 2017, the day of the 2017 Budget, might help here. They means that, if you have lived in the flat as your only or main residence throughout the period of three years leading up to the completion of the lease extension, the new exception is likely to help and the surcharge will not apply. This is now explained in more detail in the Manual here. Q. Can I avoid the surcharge by buying through a limited company? A. No. You won't be able to escape the surcharge by setting up a limited company for the purpose of buying a home or homes. The extra 3% is due on nearly all purchases by limited companies, as there are very few for below the £40,000 threshold. A. The surcharge will still apply when buying a residential property through an existing limited company. If the property is transferred into a limited company without a purchase price being paid, its market value usually applies for Stamp Duty purposes. Properties already owned by your limited company however will not 'count against you' if you are buying a personal additional property. A. The rules around trusts, which you can find more about within HMRC’s Manual and here (they were moved at the end of March 2018 from the November 2016 guidance) are pretty complicated. A good starting point is with John Shallcross' article, 3% Stamp Duty; HMRC's guidance debunked. Q. What if the home I want to buy has a 'granny flat'? A. The 3% surcharge was initially going to be applied to any property with an annex or additional property purchased alongside a main residence if the annex/additional property had a value of £40,000 or more and could be used as an independent dwelling. However, due to what it described as a 'technical unfairness', the Government made an amendment to the Finance Act 2016 to reverse this. Would 3% extra Stamp Duty put you off buying a second home? No Stamp Duty is normally payable on properties that are inherited, so the 3% premium will not be relevant. That said, if you have inherited a property and go on to purchase an additional home without selling the inherited property, you may well be hit with the surcharge. There is some reprieve for inherited properties, however. A small share (50% or less) in a single property which has been inherited within three years prior to buying another home will NOT count against you for surcharge purposes. In looking at the 50% test one adds in interests of spouses and civil partners (unless separated). Q. 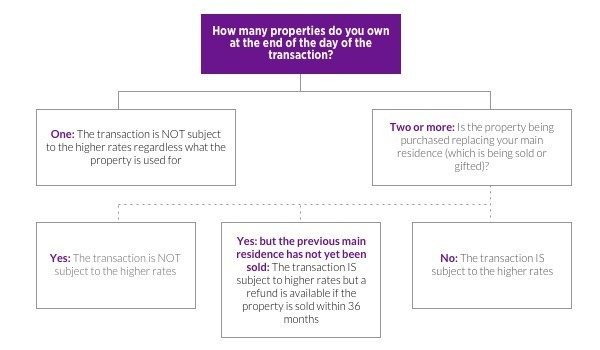 What if I acquire a property by gift? Stamp Duty Land Tax is due on the 'chargeable consideration', which is usually the purchase price, so a pure gift can be free of Stamp Duty. However, if there is a mortgage attached to the property, a proportion of its value can be liable for the tax. The same analysis is employed to see if the 3% surcharge is due. A. The 3% loading only applies to purchases of 'dwellings'. A plot of land (even if it will subsequently be used for a home) is not counted as a dwelling, so the surcharge will never apply. If you already own an empty plot of land and are buying an additional property, the plot of land will not count against you for purposes of the higher rates of tax. Q. What about derelict homes? Existing homes that are derelict should be deemed habitable for the additional tax to apply on their purchase. But what constitutes habitable and when it should be habitable by is still under dispute, as was demonstrated when HMRC lost this recent court case. A. A timeshare home – overseas or in the UK – will only be considered for the purposes of the higher rates of Stamp Duty if it is a dwelling AND you have a share in ownership which is equivalent to either a freehold or a lease granted with a term of seven years or more. However, as many timeshare deals are contractual agreements to occupy a property that is owned by another person, this will not usually be the case. A. Holiday homes – even if they are furnished holiday lets or they come with restricted use during the year – will be treated the same way as any other additional property purchases according to HMRC. It comes down to whether they are 'suitable for use as a dwelling'. HMRC say this applies even if there are planning restrictions limiting their use to part of the year. We have come across those who disagree, particularly where the planning conditions are particularly restrictive. A. On February 11, 2019 a consultation paper was published about making non-UK residents who are buying property in England or Northern Ireland, liable for an extra 1% Stamp Duty Land Tax on top of existing rates. The proposals state that individuals will be treated as non-UK residents (and therefore liable for the additional tax) if they have spent fewer than 183 midnights in the UK in the 12 months leading up to the date of the purchase completing. If the extra 1% is due, it can be reclaimed if the purchaser goes onto spend 183 midnights or more in the UK in the 12 months following the purchase. For purchases made through trusts and companies, the proposals are much more complex. A. The most important exemption – which is often misunderstood or even overlooked – is related to rules around the replacement of an only or main dwelling. You can read more about this above or by heading to John Shallcross' article, The all-important rule that could see you escape the higher rates of Stamp Duty. But there are more straightforward exceptions too. For example you won’t pay the 3% Stamp Duty Land Tax surcharge on additional homes that cost less than £40,000, nor on caravans, mobile homes and houseboats. The purchase of non-residential properties (such as offices or warehouses) will not attract the higher rates of tax. Neither will owning any of these cause a purchase of a dwelling to be liable at the higher rates. The purchase of a mixed-use property (a flat with the shop below for example) will be exempt from the higher rates too. But if you already own a mixed-use property (which includes a self-contained dwelling) and want to buy an additional property, it will count against you for the higher rates. Social landlords and charities won't be liable for the 3% loading, if the usual Stamp Duty Land Tax exemption applies to them. Q. Can I just omit to mention to my solicitor about the fact I already have an interest in another property? A. Stamp Duty Land Tax is a self-assessed tax and it's your responsibility to make an honest return, having taken appropriate advice where necessary. If you do not complete the return honestly, it's tantamount to fraud – penalties for which could be a lot worse than a 3% Stamp Duty loading. Q. What's changed in Wales? A. On 1 April 2018, Land Transaction Tax replaced Stamp Duty Land Tax in Wales. The rules are broadly similar to England's but, when it comes to the 3% surcharge, there are some significant differences. These include the way the exception works around the replacement of a main or only residence. And there is no first time buyers’ relief under Land Transaction Tax. Q. What official guidance is there? A. HMRC issued a Guidance Note on the day of the 2016 Budget. But it was criticised as being misleading in places and it failed to deal with many common scenarios. So, HMRC issued a revised Guidance Note in November the same year. Most of the guidance was moved at the end of March 2018 into the Manual with some updates, in particular to take account of the changes made with effect from 22 November 2017. The guidance has been updated a number of times since, the latest update being in August 2018. If you still need to refer to the November 2016 Guidance Note you will find it archived here. It has a Q&A section (not carried over into the Manual) that explains the replacement exception more clearly with examples. The briefer online guidance was updated on 24 March 2017, when John wrote this commentary on it. HMRC consulted on fresh guidance to replace this and published it in August 2018. John's subsequent commentary can be found here. Q. I need help working out whether the higher rates of Stamp Duty are due. What should I do? Write to: Stamp Duty Land Tax, HM Revenue and Customs, BX9 1HD, United Kingdom. Experience varies as to how long it takes to receive a reply. HMRC recently reported that they reply to 80% of technical enquiries within 15 working days, but they seem to be slower dealing with questions on the higher rates and some taxpayers report delays of nearly two months. Tweet: @HMRCCustomers with your query (account is serviced between 8am and 6pm). Be sure not to disclose any personal details on social media. Post a comment below: Your entry will not be visible immediately as comments are subject to moderation, but they'll usually be posted by the next working day. Please 'vote up' comments that you find particularly helpful. And be aware that responses do not constitute financial or legal advice. John has produced this prototype online tool taking readers through the issues. It uses Google Forms and so has limitations, but please try it and add some comments at the end when you get to “Submit Form”. No responsibility is accepted to those using the tool. HMRC’s guidance of November 2016 was moved (and slightly updated) in March 2018. You will find the updated version in the Manual starting here. If you need to look at the November 2016 guidance note (PDF) you will find it here. If you really want to get into the nitty-gritty, take a look at the legislation itself (Finance Act 2016 section 128) as amended by Finance Act 2018 Schedule 11. COMMENTS DO NOT CONSTITUTE FINANCIAL OR LEGAL ADVICE AND ARE PROVIDED FOR GUIDANCE ONLY. IT IS ASSUMED THAT PROPERTIES ARE IN ENGLAND UNLESS STATED OTHERWISE. ADVICE SHOULD BE SOUGHT BEFORE PROCEEDING WITH ANY TRANSACTION. THE SAME APPLIES TO THE COMMENTS SECTION OF ZOOPLA'S WEBSITE.